We love lighthouses — symbols of heroism — and we love to eat. Having lived in or traveled to many areas of the country, we wanted to share both of these experiences. When a lighthouse-loving chef got together with an international food and wine journalist to explore coastal cuisine, the result was an award-winning book: The American Lighthouse Cookbook: The Best Recipes and Stories from America’s Shorelines. This book is full of the romance and history of lighthouses, with recipes based on local ingredients from every coastline of America. For each of the dozens of lighthouses in The American Lighthouse Cookbook, the authors have created menus that reflect each one’s heritage, as well as trends in current cuisine in the area. The book appeals to coastal tourists and residents, fish and seafood enthusiasts, and historians and patriots – and, of course, lighthouse aficionados. Combine available local foods with local history and culture to explore recipes unique to your area. These recipes appeal to people who live locally, to people and families who have moved away, and to visitors looking for another dimension to remembering their stay in your area. Cookbooks and food books are perennially interesting to readers, as long as they tell a story. It’s critical to have a structure and definition of the topic, and strict adherence to recipe formatting. Becky Sue Epstein is an award-winning journalist and an experienced editor, broadcaster and consultant in the fields of wine, spirits, food and travel. Currently based in New England, she is an editor at several national publications: Senior Editor, Wine & Spirits for Intermezzo Magazine, Contributing Editor for The Tasting Panel and an Editor at www.PalatePress.com . In addition, she is a Contributor for the travel site www.Gayot.com and is featured as a correspondent on the radio at www.iwineradio.com as she travels regularly to wine regions across the country and around the world. In between trips, tastings and events, Epstein writes books. Her award-winning The American Lighthouse Cookbook, was published in September 2009 (Sourcebooks/ Cumberland, co-written with Chef Ed Jackson.) A major update of her classic kitchen reference, Substituting Ingredients, was published in June 2010 (Sourcebooks) and is continually being reprinted. Her latest book is Champagne: A Global History. (Reaktion Books, October 2011). She is currently researching her next books, Brandy: A Global History, and The National Parks Cookbook. Chef Ed Jackson graduated from the prestigious Culinary Institute of America in Hyde Park, New York in 2000 with the President’s Scholarship Award. Since relocating to the Boston area with his family, he has worked at several prominent restaurants including Maison Robert, Tremont 647 and The Tuscan Grill. Currently, Jackson is in production on a video cooking series called “Chef Ed Cooks.” He is also a Demonstration Specialist with Whole Foods Market. 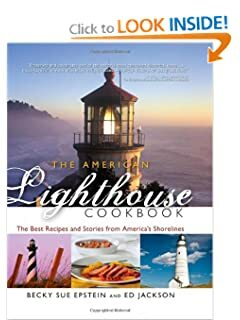 In September, 2009, Ed Jackson and Becky Sue Epstein published The American Lighthouse Cookbook — by (Sourcebooks, Inc.) — winner of The National “Best Regional Cookbook” 2009 (NBBA) by USABookNews.com. The two are currently researching their next collaboration, The National Parks Cookbook. Jackson’s latest book, The Complete Idiots Guide to 200 – 300 – 400 Calories Meals, just hit the shelves in August, 2012.